In Amazon Device Farm, automated tests can be run using Appium, Calabash, etc. You can read about the complete list of supported test types here. I have tested an app using Appium Java TestNG framework in ADF. This post is a step-by-step guide on how to run automated test scripts for mobile apps on Amazon Device Farm across a wide range of devices. * and used across all of the test classes. * This allows the navigation to work within the app. * The category name is returned so we can navigate to it from the navigation drawer. * This method runs before any other method. * We are setting up our appium client in order to connect to Device Farm's appium server. The local environment is now set up with an Eclipse project that consists of TestNG tests. Now run the test suite locally with Appium and validate the tests. If the test run is successful, then get ready to run the tests on Amazon Device Farm. A package in .zip format needs to be created to upload on ADF. This package should contain Android Appium Java TestNG tests and all the test dependencies. Pom.xml of the Maven build needs to be modified before creating a .zip package. Refer to this link to meet the requirements during the package stage of a Maven build. A zip-with-dependencies.zip file will be created in the target folder. Open the AWS Console and login. Go to the Device Farm and create a project. Inside the project, select Automated tests > Create a new run. Upload the Android APK file. The details will be displayed as shown below once the APK file is uploaded. 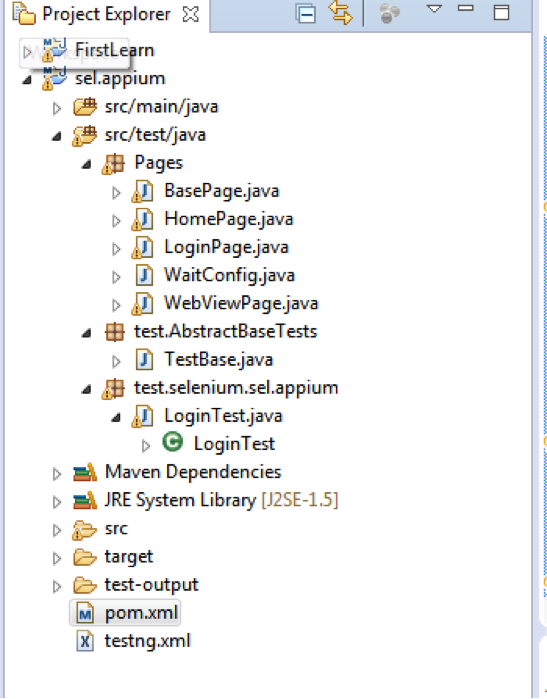 Configure test: Select test type > Appium Java TestNG and upload the .zip file that contains both the test and dependencies. Select Devices: Select the devices on which you want to run your test. The default device pool can be selected or you can create a new device pool of your choice. Specify Device State: Here we can specify device states to override any device settings. This allows for the adding of additional data and/or the installing of additional apps for ADF to use during the run. Also, we can specify whether Wi-Fi, Bluetooth, GPS, or NFC will be enabled during the run, pre-set the device latitude and longitude for the run, and pre-set the device locale for the run. Review and start run: Here we can change the uploaded APK file, test file (.zip file), and Device pool. Confirm and Start Run: Click on the “Confirm and Start Run” button. This will take a different amount of time depending on the app size and test cases. Test results are displayed once the test run is complete. Amazon Device Farm test reports provide pass/fail information, logcat captures, device logs, screenshots, videos, and performance data. Click here for detailed information on analyzing reports in ADF. This doesn’t end here. In my next post, “Continuous Testing Using AWS Device Farm,” we will continue our exploration of Amazon Device Farm by looking at continuous integration using this system. Very helpful, I am able to do set-up with this document. Is this config support for android versions ? This is really very nice article. I need more information regarding AWS device farm. I have created test project pretty much similar to the one which is mentioned in the blog, but I have added cucumber layer. I have written feature files as well. Now, I am not sure how to upload test project on AWS device farm. Under “Configure a test” section, which one to choose ? My Appium script perfectly working on local but moving to aws device farm, returns parsing error because of one class file. I am trying to import data from an excel file within this class file. I think error because of the path of excel file. I upload the data excel file as extra data in aws but i can’t find out the location. Can you please provide sample project ? How can we control the test execution order using testng.xml file on aws device farm? Ho to configure pom.xml to execute test cases from testng.xml?